"The Exciting Journey of Turning Visions Into Lifetime Memories"
We have realized that while sitting and writing about how the bride can shop to find her perfect dress for that special day, there is another person that seems to get neglected. It is automatically assumed that with the groom they will go to the tuxedo shop and work it out for him and his groomsmen. As I was thinking about this, I started to question, "Why should any of them get a tuxedo?" When women go and shop for their bridal gown or their bridesmaid dress, more times than not, it is a purchase to buy and keep forever. Very seldom to you hear about women renting their wedding/bridesmaid dresses (although I know it does happen). So, why is it that more men don't go to a suit shop instead of a tuxedo shop? Think about it, men will go to a shop and rent a tux for $100 or more, especially if they want a good quality one. They end up with something that may not fit quite right, and in the end, their $100 gets returned back to the place they rented it from. So, maybe men should start considering taking that money and going to get a tailored suit for their special occasion. There are some very good reasons why this may be something for you to consider. I tell you, there is nothing like a man who can wear a tailored suit. On the opposite side, there are also reasons why a tux may be the choice for you. In first looking at renting a tuxedo, the above picture is an obvious reason. If you are planning to match the color of your wife to be, then then tuxedo is the way to go if White or Ivory are your choices. This is mainly because I highly doubt, you will wear it ever again. Another reason why renting maybe be more for you is because it is more or less a one stop shop. Along with the tux of your choice, you also get your shirt, buttons, and cuff links. Even though your accessories are an added expense, you also get your vest, tie, and shoes. The upside to this is you don't have to shop around. The downside is this is what can drive up the price of your rental. The color choices for your tux rental is also limited. Usually you choose from Black, White, Ivory, and sometimes Gray. 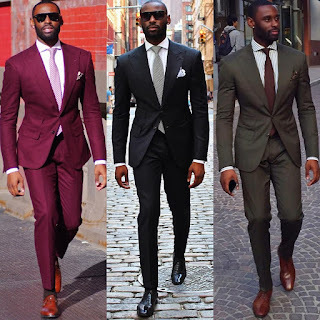 When you get into the Gray, and possibly the Dark Brown, your style choices are few and far between as oppose to the traditional black tuxedo. Asking for the the colors that are not "the norm" could also increase the price of your rental. Also, the thing to consider is that your rental has to get back to the store on time otherwise, there is an additional expense you incur. So, in hindsight you are spending a lot of money for something you will not keep. Now if you are the couple that are trying to reduce costs, this option may take a large portion with really nothing to show for it in the end, except for the beautiful pictures you will take. This is an option that couples probably don't consider, but maybe it may warrant a discussion. Although it is very possible, you will be spending more money than you would for renting, there are more benefits in the long run. 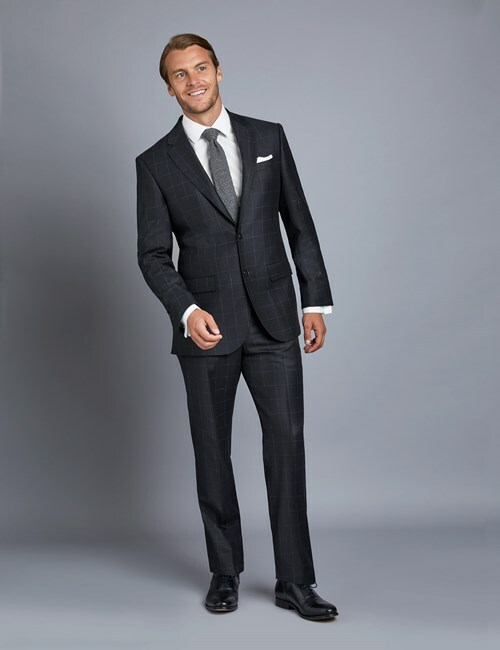 The first benefit is when purchasing a suit instead of renting, you can have the suit tailored . 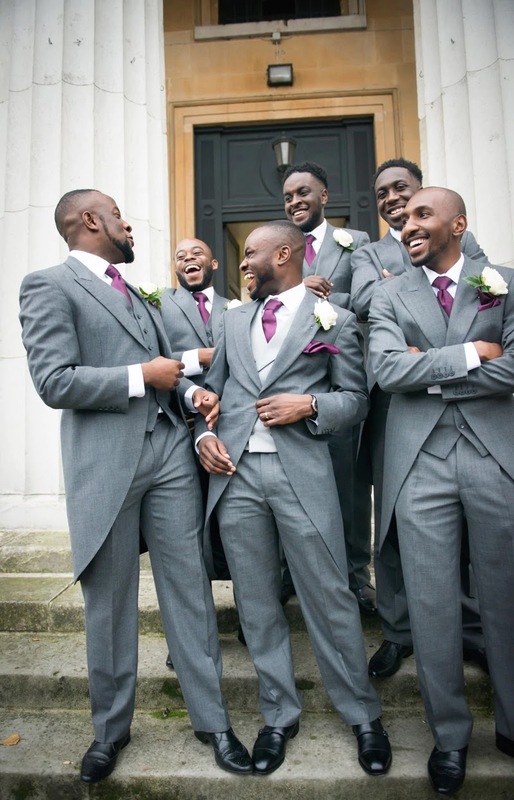 By going to a Men's clothing store (such as Men's Warehouse or Macy's) and purchasing a suit from their rack selection, the Groom and his Groomsmen will then be able to have the suit jacket and pants tailored to fit them in a way a regular tuxedo cannot. Also, there is a better color selection for a suit as it is shown in the above picture. If you are going to an island for your ceremony, maybe a khaki suite will work well with the blue tones you are planning for the décor. It also gives you an opportunity to pick accessories that work for you like your shirt and tie. You will also be able to shop for shoes to compliment your suit as well. 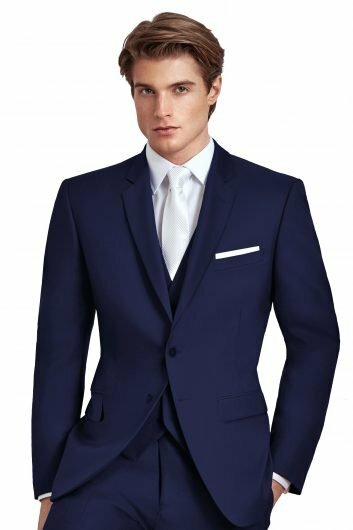 In the end, yes you spend more than your traditional tuxedo rental, but the silver lining is that on the day after your wedding, you can pack up your suit and take it home with you because it is yours to wear again and again. Which ever option you decide to choose, make sure it is the best decision for you, and that you are happy with your choice. Either way, that Groom and his Groomsmen will be looking sharp. We are talented and educated businesswomen, governed by Christian doctrine, whose goal is to provide a unique and professional style of event planning and coordination. Our priority is to allow our clients to feel comfortable and confident that everything seen in their vision is put into fruition with finesse, and expertise.